It takes 600 litres of selected milk to make one single 40kg cheese wheel. Every boiler gives two cheese wheels each day, every single day of the year. Every morning the milk is poured into the reversed bell copper boiler; half of this amount of milk comes from the production of the day before, after a whole night of aging in big tanks, during which the fat of the milk surfaces (it will be separately used for the production of butter). The second half of the total amount of milk required comes from the daily production batch of whole milk, with the addition of buttermilk and rennet, rich in milk enzymes. The milk starts to coagulate in 10 minutes, then the mixture gets to reach the temperature of 55°C while constantly stirred. The Casaro is the one asked to perform this operation, called Spinatura, and his experience tells him when the mixtures gets to the desired consistency, and how to let the fat part of it fall to the bottom of the tank. 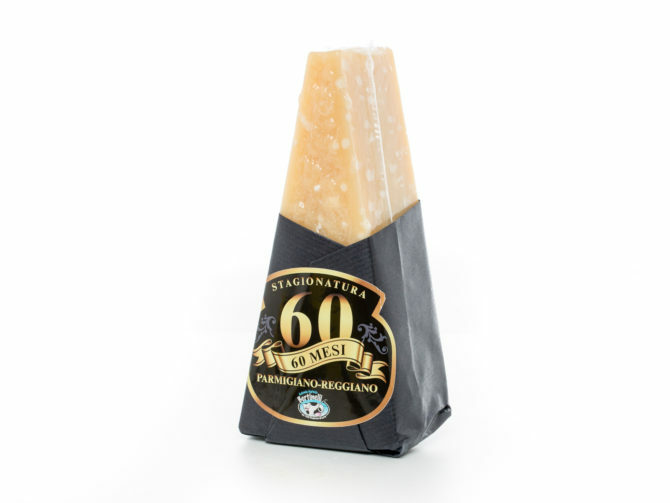 The mixture concentrates and gets divided in two halves, folded in a rug and placed into plastic frames where it is marked with the typical Parmigiano Reggiano dot lines. shape, making the wheel an example of the best cheese in the world. Our Parmigiano is obtained solely from Red Cows’ milk, a selected breed that has been living in the region since Countess Matilde di Canossa’s era. This amazing cheese features a splendid straw-like yellow, and a sweet, soft, full and intense taste.